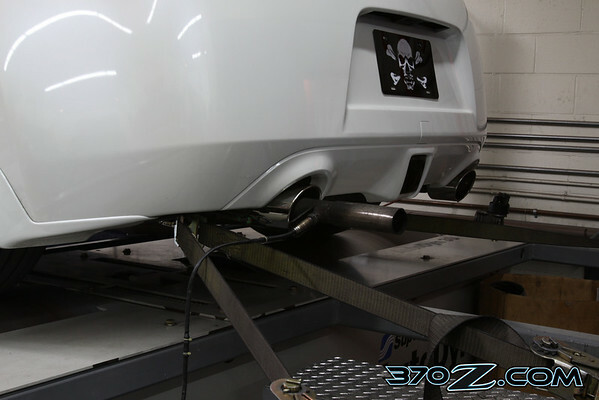 It’s been a hard day’s night or at least a couple of long days, but we have completed our comprehensive dyno test of many of the currently available performance parts for the Nissan 370Z. For this round of testing we used the Superflow AutoDyn 30 chassis dyno at Technosquare Inc. The AutoDyn 30 is a dyno that uses both inertial and static loading with weighted wheel rollers and an eddy current power absorber. This is a very different method of measuring power from the common Dynojet dyno which is purely an inertial dyno. The AutoDyn 30’s principal advantage over the Dynojet is that it can load the engine more than a Dynojet to give more accurate results and to give the engine and drivetrain loads more closely mimicking what they actually see when they are being driven. The eddy current power absorber makes also the AutoDyn 30 better for tuning. 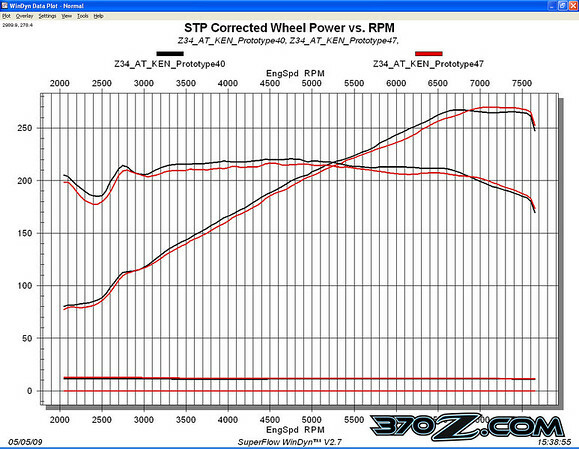 One major difference between the AutoDyn 30 and the Dynoject is that it gives lower, more conservative power results than the Dynojet, so don’t be surprised if you see bigger number for 370Zs parts from other sources, the important thing to see here is the difference in power from run to run, not from dyno to dyno. We strove for accuracy and repeatability in our testing. We did all of our testing during one day. We used standard SAE correction. We thoroughly warmed up the engine and the drivetrain by driving the car on the dyno at speed for about 10 minutes to warm the engine, transmission and differential oil (this car is equipped with Technosquare’s oil cooler kit) as well. We started every dyno pull at the same water temperature and allowed the car to normalize after every pull by letting it run on the rollers with no load after each pull until the water temp stabilized. We monitored the air fuel ratio on every run to make sure that the tested part was affecting performance, not what the part did to the tune. We used an automatic transmission equipped 370Z for our mule. You might be disappointed in this but the Automatic on the 370Z is not your typical automatic but a performance tuned one with some unique features. First the user has a lot of command authority and the transmission in manual mode will stay locked in gear for the entire pull without prematurely upshifting like a typical automatic transmission. Second and most importantly, the lock up clutch on the 370Z’s transmission stays solidly locked up in-between shifts so it does not suffer from power eating slip like your typical automatic. We have found in previous testing that the automatic transmission version of the 370Z looses little power when compared to the manual transmission. We will test a bunch of parts on a manual transmission equipped 370Z in the near future anyway so stay tuned manual transmission fans! As you can see the Stillen long tube cold air intake delivered most of the power gains at high RPM. 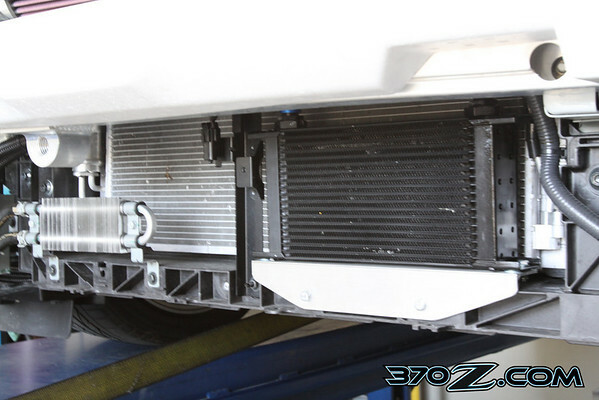 When we retested the intake without the bumper cover, it gave 10 hp more than this accross the board! Stillen give us bumper vents! For our baseline pull our test mule impressed with an average pull of 267 whp and 220 lb/ft of torque. Remember if this seems low that this is not a dynojet. The first part up for testing was Stillen’s long tube cold air intake. 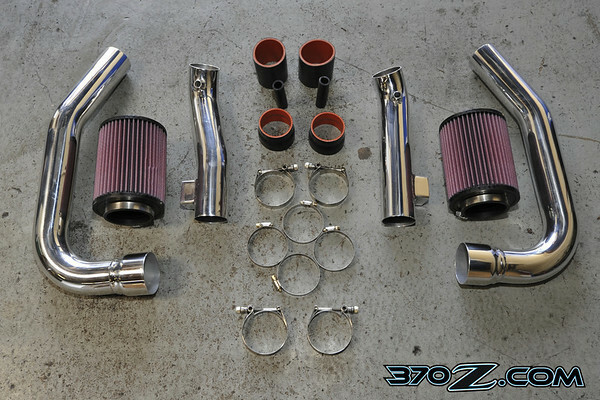 Stillen’s long tube cold air intake kit is quite an impressive piece made of beautiful mandrel bent polished aluminum tubing with billet mass air flow meter sensor blocks tig welded to the tubes for a smooth integrated look that looks awesome when the hood is popped. The intake tubes snake from the intake manifold plenums through the core support to the front of the car behind the upper part of the bumper fascia where the twin high flow air filters hide.